Tilidine (INN, USAN), or tilidate (BAN) (brand names: Tilidin, Valoron and Valtran) is a synthetic opioid painkiller, used mainly in Germany, Switzerland, South Africa and Belgium for treatment of moderate to severe pain, both acute and chronic. Its onset of pain relief after oral administration is about 10–15 minutes and peak relief from pain occurs about 25–50 minutes after oral administration. It usually comes in its hydrochloride hemihydrate salt form; in this form it is highly soluble in water, ethanol and dichloromethane and appears as a white/almost white crystalline powder. Its storage is restricted by its insensitivity to light and sensitivity to degradation by oxygen, hence necessitating its storage in amber bottles and at temperatures below 30 degrees Celsius, respectively. Tilidine itself is only a weak opioid, but is rapidly metabolised in the liver and gut to its active metabolite nortilidine and then to bisnortilidine. It is the (1S,2R)-isomer (dextilidine) that is responsible for its analgesic activity. ↑ Vollmer, KO; Thomann, P; Hengy, H (October 1989). "Pharmacokinetics of tilidine and metabolites in man.". Arzneimittel-Forschung. 39 (10): 1283–8. PMID 2610722. 1 2 3 4 5 6 7 8 9 "Tilidin N Sandoz® DP Lösung zum Einnehmen" [Tilidin N Sandoz ® DP oral solution] (PDF) (in German). Wooden Churches: Sandoz Pharmaceuticals GmbH. December 2012. Retrieved 18 April 2014. 1 2 3 4 Brayfield, A, ed. (13 December 2013). 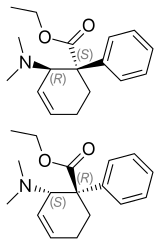 "Tilidine Hydrochloride". Martindale: The Complete Drug Reference. Pharmaceutical Press. Retrieved 18 April 2014. ↑ Tings, T; Trenkwalder, C (2003). "When L-Dopa Preparations, Dopamine Agonists or Opioids? Therapy of Restless Legs Syndrome". MMW Fortschritte der Medizin (in German). 145 (10): 48–49. PMID 12688028. ↑ Waldvogel, HH (2001). Analgetika, Antinozizeptiva, Adjuvanzien: Handbuch für die Schmerzpraxis (in German). ISBN 978-3-540-65796-5. 1 2 Buschmann, H (2002). Analgesics: From Chemistry and Pharmacology to Clinical Application. Wiley-VCH. ISBN 978-3-527-30403-5. ↑ Schulz, R; Bläsig, J; Wüster, M; Herz, A (1978). "The Opiate-Like Action of Tilidine is Mediated by Metabolites". Naunyn-Schmiedeberg's Archives of Pharmacology. 304 (2): 89–93. doi:10.1007/bf00495543. PMID 212687. ↑ Drug Discovery and Commercial Exploitation Gerhard Satzinger Drug News Project psges 200–201 14(4) May 2001. ↑ US patent 3557127, Satzinger, G, "Substituted Cyclohexenes, Derivatives thereof and Processes for Obtaining Same", issued 1971-01-19 .